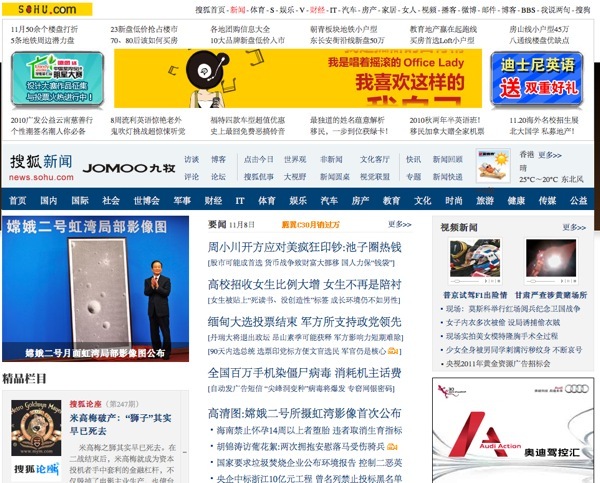 As I browsed through the usual mainland Chinese news sites on November 2, I was struck by how many banner headlines announced the mid-term elections in the United States. “Voting Opens Today in U.S. Mid-term Elections,” read the first headline. I visited as many sites as I could and found that they were all reporting, sometimes even with special topic pages, on how the American people were heading to the polls. Actually, this is something I’ve had my eye on for some time. 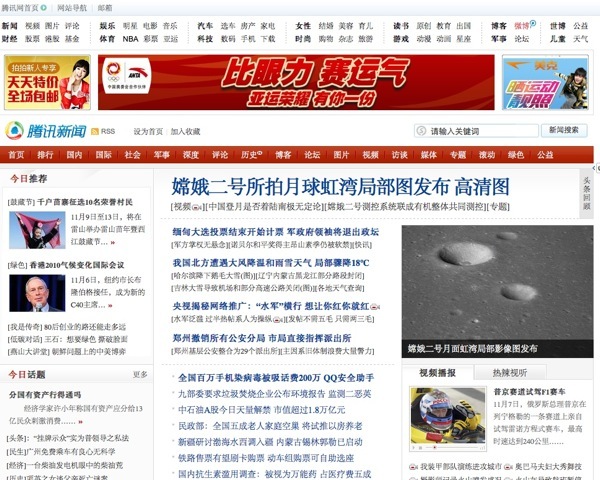 I’ve watched Chinese media obsess over elections in Australia, Taiwan, the United States and, most recently, Burma. I seriously doubt the media of any other country on earth would put so much emphasis on elections happening in other countries. Nor would the people in any other country care so intently about the outcomes of these elections. It’s worth thinking about why this is happening. In democratic countries, or in regions like Hong Kong, democratic elections are a part of life, and they occur routinely. Insofar as they engage people in the management of the affairs of their country or community, elections are a valuable part of citizens’ lives. Generally, I think voters tend to see their own elections as having immediate relevance, while elections happening elsewhere in the world are of only remote importance — something to interest policy makers, academics and various other experts on international affairs. Moreover, it can often be difficult for people from one democratic country to grasp the issues at stake in elections happening in another. How much stranger is it, then, that mainland Chinese, who don’t have democratic elections, but only Communist Party conferences every five years, should be so keenly interested in watching others exercise their democratic rights? I can imagine someone saying, well, elections in Taiwan directly concern the cross-straits relationship. Or the outcome of mid-term elections in America could affect US-China relations or the Renminbi exchange rate. OK, sure. But cross-straits relations have been a thorny issue for 61 years already, and US-China relations have always worked this way. When in the past have we ever kept our eyes so glued to coverage of elections around the world? By contrast, our lack of engagement with political issues that immediately concern us is astonishing. The average Chinese person doesn’t even think to ask where the top Communist Party leader in their county is actually from. They don’t question whether the demolition of their neighbor’s home was lawful or not, or whether the taxes they pay out annually are being used properly. The average news reader in mainland China almost certainly knows more about democratic elections in America than they do about how their local People’s Congress works. We should know from a recent case in China, in which a university student was killed by a luxury sedan driven by the self-indulgent son of a local police official, that the question of how those in power behave can be a matter of life and death for our own children. But how many Chinese know who their deputy police chief is? One might imagine that all this attention to elections in other countries is fostering more democratic attitudes in China. Strangely, the opposite is often true, and misunderstandings abound. 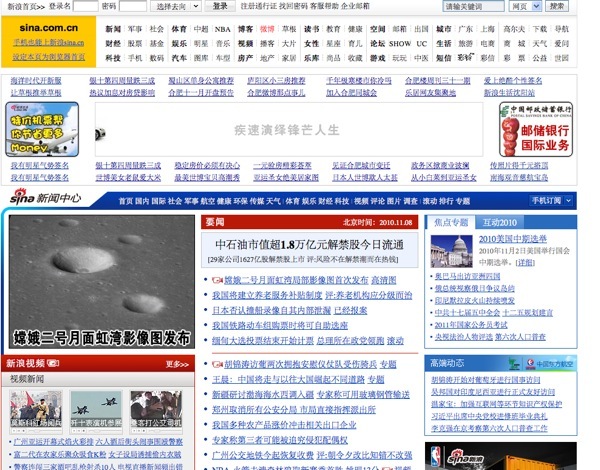 Completely divorced from the real questions and decisions upon which foreign elections turn, Chinese news consumers often come away with the impression elections are just a big pain, stirring up chaos and division. More serious is the impression many have that elections create new problems rather than solving existing ones. They come away with the basic impression that elective systems are riddled with problems. One mental stumbling block is the notion of the “loser” in democratic elections. In China, where people have never experienced democratic elections, it’s impossible to imagine how social harmony can result when close to half of the voters in any election back candidates who “lose.” How much better it is, many Chinese imagine, to have instead of an elected government one that represents the interests of all people — where there is no need for elections, and everyone wins, even if decisions are made in secret. Figures from foreign opinion polls also take on an interesting life of their own in the mainland Chinese context. These polls, which are done by professional pollsters in democratic countries, are quite easily understood in their home countries. But transplant them to China, where there’s no such thing as a true opinion poll, and they are often lost in translation. A news report on China Central Television, for example, plucked out some numbers from an opinion poll taken ahead of the recent mid-term elections in the United States, which said that 47 percent of American voters cited the economy as the top issue. Less than twenty percent said they were most concerned about “political issues,” which Americans might understand as such things as gridlock in Washington. A lot of my friends felt the same way. People want to know whether there will be food on the table, or whether property prices will go down. What all of them fail to understand, however, is that all of these economic issues Americans have cited as the number one issue in the election are political issues all the same. Your average American voter, taking politics into their own hands by heading to the polls, would understand this as a matter of commonsense. Sure, Americans may say the economy is their top concern — but the point is that they already have the political right to exercise their vote as a means of shaping economic policy. Chinese have to understand the fundamental difference between Americans focusing concern on economic issues and Chinese focusing concern on economic issues. If the people lack the most fundamental political right to participate in decision making, the economic issues they face will never completely be resolved. I don’t deny that there have been supreme rulers in Chinese history who have loved their subjects as they do their own children. A few managed to accomplish things within a short period of time that democratic governments might be unable to accomplish at all. But if you look at the whole sweep of our history, covering thousands of years, isn’t the problem plain as day. If so-called economic issues could be tackled effectively by economic means alone, our country would have solved them long ago. Once our benevolent leaders understood the will of the people, they would act to solve those problems near and dear to them. When, though, have things ever worked this way? When have we seen real control of such problems as corruption, staggering inequity of wealth, and runaway power? And if we can’t truly get a handle on these things, how far can we go in solving other problems? I apologize for interrupting you while you’re enjoying all of the election coverage. But I encourage you to try to really understand the significance of those boisterous elections you are watching, which provide the answer to all of the questions I’ve just raised. This article is a translated and edited version of a November 2 post to Yang Hengjun’s Blog. 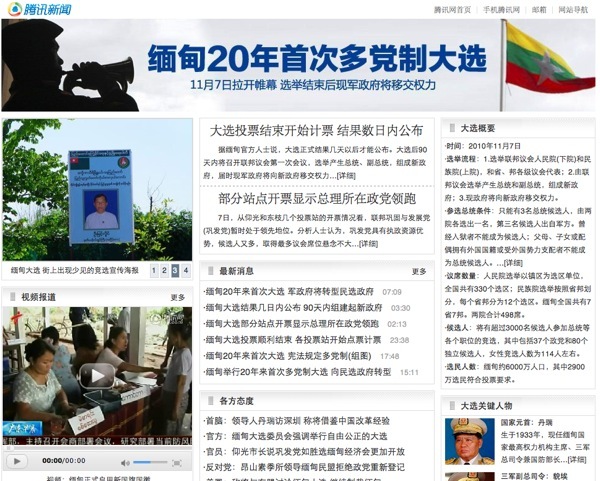 BELOW IS A SELECTION OF CHINESE ONLINE NEWS PAGES APPEARING YESTERDAY, ALL OF WHICH INCLUDE PROMINENT COVERAGE OF ELECTIONS IN BURMA.